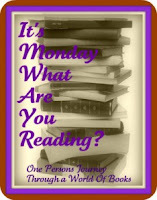 It's time once again for "It's Monday, What are You Reading?" now over at One Person's Journey Through A World of Books, here. Last week: Author Craig Larsen sent me a message via goodreads that he thought perhaps I might enjoy his book, Mania, and I did. I didn't enjoy it because it was a free copy (I have tons of those), but it was a different kind of suspense novel. My word of warning on this one: don't let the flashbacks get to you (if you decide to read it, that is). Take it very slow, and don't power read through it. After that, I traveled up into the Norse countries with Box 21, by Anders Roslund and Borge Hellstrom, which was so good I bought the preceding book in the series, Beast. Box 21 was difficult to read due to the subject matter, but was so well written that it sucked me in immediately. A no-miss for readers who love Scandinavian crime fiction. It makes Wallander look tame. And speaking of Wallander, I had pre-ordered Henning Mankell's new book, The Man From Beijing and set to work on it immediately. I love Henning Mankell, but this one wasn't one of my favorites from him. Rumor has it there's another Wallander in the works so I'm waiting patiently. Okay, maybe not patiently. But I'm waiting. The last of the Scandinavian books, this time a prize-winning novel, was Out Stealing Horses, by Per Petterson, a beautiful book which I highly recommend, or at least I will when I write my review. This is my choice for our book group, which meets tomorrow, so I'll be back with a review and what my group thought about this book. Moving westward in my book travels, I moved over to the UK with Jo Bannister's No Birds Sing, which is #4 in a series that I've owned for a long time and feel obligated to finish. I think there are maybe three more left to go. And continuing ever west, I landed back in the good old US of A with Scarlet Women, a historical mystery set in 1870s New York. Currently I'm reading two books. First, there's Venetia Kelly's Traveling Show, a Librarything ER read, set in Ireland in the early 1930s and which I'm loving. I will definitely finish this one in the next day because my review is due. The other book is an oldie but still a goodie, Smilla's Sense of Snow, by Peter Hoeg, which I read absolutely eons ago. My husband is away on business travel, and when he's gone, I often eat dinner accompanied to stuff I'd previously TiVo'd. Last night, I found that I had TiVo'd the movie made from this book, got more than halfway through it, and realized I didn't remember the ending and wanted to read it. So I picked it up and started reading. Over the course of this week I have plans to finish Smilla, then my Amazon Vine Review copy of Ian McEwan's new book Solar should be arriving tomorrow so I'll read that. I also want to read Russel McLean's crime fiction book The Good Son, which is set in Scotland and looks really good. I don't think I'll add any more to the list so I can at least be realistic in setting reading goals. Wow -- you've got a lot of reading to look forward to. Have a great week! I've only read one of Ian McEwan's books, Atonement, but I liked it. I hope you enjoy Solar. I can't remember what that one is about. I've never read Smilla's Sense of Snow but the movie looked interesting. I hope you enjoy your books! Have a good week of reading - I am of to check out your review of Mania. I have both Venetia Kelly and Solar here waiting for me to crack them open. I just haven't been reading as much as usual and the review books are piling up and starting to mock me! I just got Solar today, in fact, about 10 minutes ago. I know the review-book-mocking-you syndrome very well...which is why I keep them at a minimum any more! Thanks for your comment...Venetia Kelly is awesome. Realistic reading goals- that's what I need. I know it would be easier if I bought less books but...that's out of the question. About that buying books thing...I've recently decided to put myself under a self-imposed moratorium for book buying for 2 months. Well, that doesn't count the books I've already pre-ordered, but I feel this need to read some of the books I already own. We'll see if it works out! Wow! You have a lot of great reading ahead of you! I have Out Stealing Horses in my TBR pile. I'm curious to read your review about it. I may have to move it up! Happy reading! I so want to read Mania, glad you enjoyed it! Happy reading! We like a lot of the same genres/books. Must go add Mania to my wish list now. I read Smylla's Sense of Snow twice, and saw the film. Have fun reading! That's a lot of Scandinavian books! I think my knowledge of the area's literature is probably limited to Stieg Larsson. Enjoy your reading this week!